Taparia Allen Key Set Black 9pcs MetricAllen Keys are made from special grade Alloy steel which withstands up to 30% higher Torque as compared to Allen Keys made from CrV Steel.Higher hardness of 57 to 62 HRC offered in case of Brown Allen Keys along..
Taparia Allen Key set Black 9pcs MetricBlack Allen keys are made from Chrome Vanadium Steel which withstand upto 30% higher torque as compared to Allen keys made Carbon Steel. 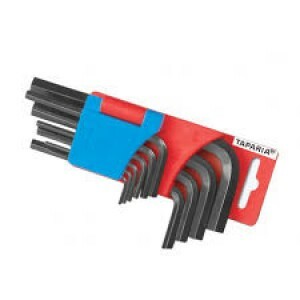 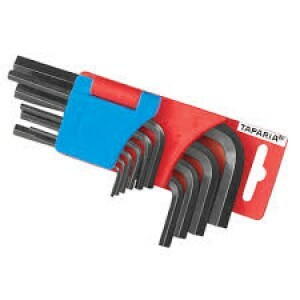 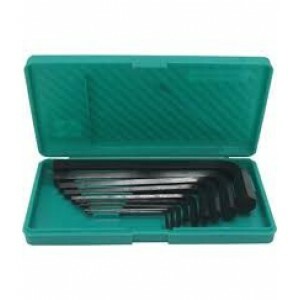 Higher strength and low price makes it suitable for personal and professi..
Taparia Allen Key set 10pcs Black InchesBlack Allen keys are made from Chrome Vanadium Steel which withstand upto 30% higher torque as compared to Allen keys made Carbon Steel. 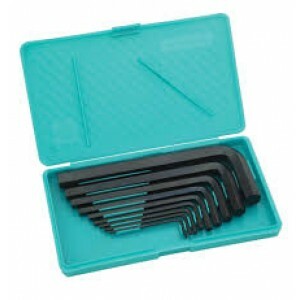 Higher strength and low price makes it suitable for personal and profess..
Black Allen keys are made from Chrome Vanadium Steel which withstand upto 30% higher torque as compared to Allen keys made Carbon Steel. 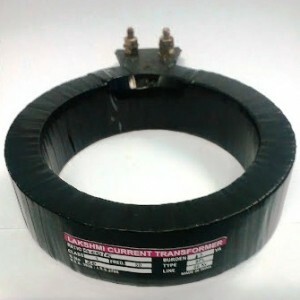 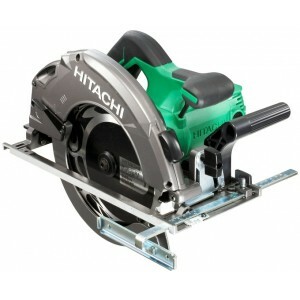 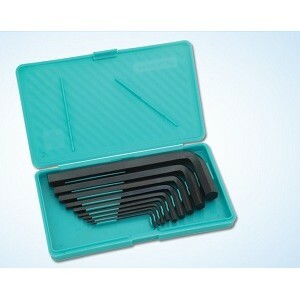 Higher strength and low price makes it suitable for personal and professional use. 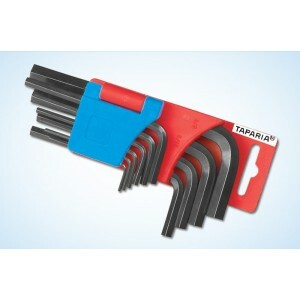 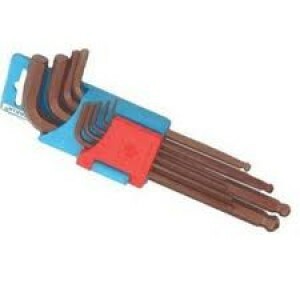 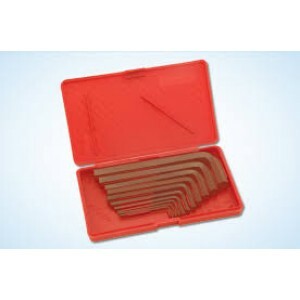 Allen keys 9 Pcs. 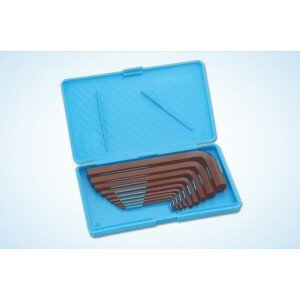 Set 1.5mm, ..
specification : sizes : 1.5 mm , 2 mm, 2.5 mm , 3 mm , 4 mm , 5 mm , 6 mm, 8 mm, 10 mm ..
specification : sizes : 1 / 16 , 5 / 64 , 3 / 32 , 1/ 8 , 5 / 32 , 3 / 16 , 7 / 32 , 1 / 4, 5 / 16 , 3 / 8 ..
Taparia Allen Key set Long Ball Point inch 10pcsBlack Allen keys are made from Chrome Vanadium Steel which withstand upto 30% higher torque as compared to Allen keys made Carbon Steel.Higher strength and low price makes it suitable for personal and p..
Taparia Allen Key set Long Ball Point Metric 9pcsBlack Allen keys are made from Chrome Vanadium Steel which withstand upto 30% higher torque as compared to Allen keys made Carbon Steel. 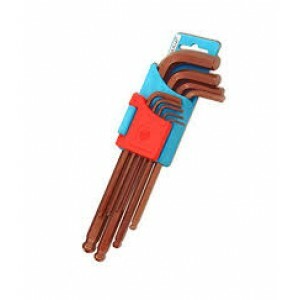 Higher strength and low price makes it suitable for personal an..
Taparia 9pcs Allen Key set Brown Finish Brown Allen Keys are made from special grade Alloy steel which withstands up to 30% higher Torque as compared to Allen Keys made from CrV Steel.Higher hardness of 57 to 62 HRC offered in case of Brown ..
Taparia 9pcs Allen Key set Brown Finish Brown Allen keys are made from special grade alloy steel, hardened to 57 to 62 HRCTorque and life is 30 percent more then CRV steel Allen keys and looks aesthetically goodAvailable in mm and inch Descr..